Hi everyone! I get a lot of questions on how to create lapbooks, and how we use them in our homeschool. I thought it would be easier to show you all in a “How To Make a Lapbook” video tutorial for you! First I wanted to talk a little bit about what a lapbook is and how to use it in your homeschool or classroom. So what is a lapbook? Lapbooking is simply a hands-on method of teaching students about any topic! They can include drawings, writings, timelines, pictures, graphs, and any other information that fits your topic. They can be as simple or complex as you like based on the age of your students. Speaking of ages, while they’re typically used for younger elementary level students, really Lapbooks can be used for any aged student as the content is completely up to you! Lapbooks are an effective learning tool because they incorporate hands-on educational activities that can accompany any lesson. They’re also great to help review materials learned later on. 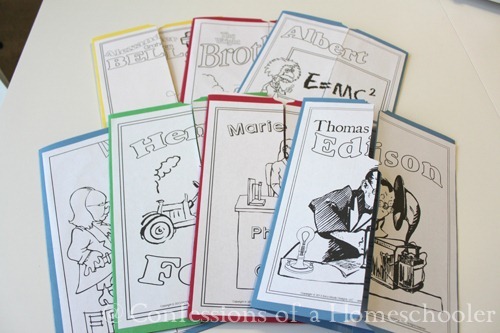 As students learn about a particular topic, they’ll create “mini-books” that are slowly added to a larger Lapbook. So in the end they’ll have a lovely final product that they can keep for years to come! So how do you put a Lapbook together? How do we use lapbooking? We typically use them to learn about something specific. Sometimes we’ll add them in simply for a fun unit study, and sometimes we create them to go with a particular subject or concept we’re learning about. For example, sometimes I’ll let the kiddos pick their own topic they’d like to learn more about. So Turbo did one on sharks, Strawberry Shortcake did one on Horses, and Tinker Bell did one on her favorite book “Jesse Bear What Will You Wear”. As most of you know, our favorite ways to use them are to learn about things like specific artists, composers, scientists, and literature. As we read about these people, or through books, we create small mini-books to add to a larger lapbook. The process of making these smaller pieces really helps the kiddos to remember what they’ve learned about. And of course at the end of the unit, we have a fun and interactive booklet that they can use to review, and keep for years to come! I hope you enjoyed this video tutorial on how to make your own Lapbooks, if you have any good Lapbook tips to share, make sure to leave a comment below! Hey Erica! GREAT job:) It was nice to see your smiling face and to hear your voice! I am off to make my lapbooks now! Totally inspirational! LOVE it!! that was fabulous, Erica! Seriously, my mind was blown. Could be the late … er, early … hour (yay middle of the night feedings with a baby lol), but regardless of the reason, I had never considered anything beyond a basic tri-fold lapbook. Perhaps because I’m fairly new to them myself and can barely come up with content for that much space. I’m excited for morning when I’ll be able to look at some of your resources without getting too wired tonight. Thank you for taking time to to make such a great video! It kind of sounds like the History Pockets we’ve been using! My kids are doing well learning a little bit at a time and having it involve some reading, coloring, crafting, etc. We love to make lapbooks and have made many of yours. I’m wanting to make one for Indian in the Cupboard. I’ve wondered how you make the literature lapbooks with activities for each chapter. Do you read the book alone in advance or oz there a great website or source you use that summarizes the book? We have really enjoyed your literature units! Love this! I have read SO much about lapbooks but never fully understood what they were for. I am so doing this! So, is notebooking the same thing or not? I see a lot of tweets about free notebook pages. Thank you so much for the inspiration Erica! The kids and I made our first lap books today to study St Patricks Day. We enjoyed making them so much and look forward to completing them this week. Thanks for the video! I am new to lapbooking and have a question about the mini-books that you put on the inside. Do you use regular printer paper or card stock? I want to use lapbooks with my Kindergarten son and am afraid regular paper won’t hold up, but yet card stock is expensive. What have you find works best with the younger kids? I want to know how do you store and organize your completed lapbooks. I read your post “I can’t homeschool because…” And organization is a big problem for me. I’m so scared to homeschool for so many reasons but am really considering it for next yr. We’ve taken this spring break as a trial run at homeschool and i have to say that this week has been GREAT but I’ve been reading your blog for a while and I love it. Thank you so much for being an inspiration.